Tension members are considered to be carrying only axial force. Tension members are subjected to uniform stress because their entire cross-section is used for carrying axial forces. 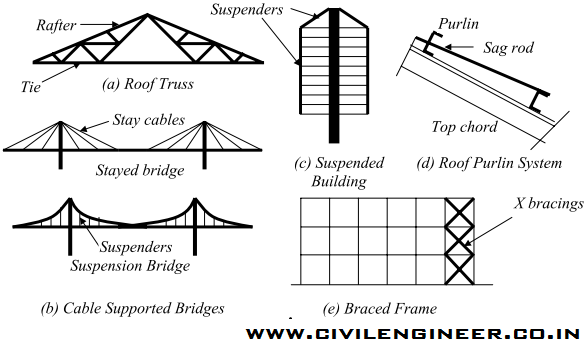 Ties, suspenders of cable stayed and suspension bridges, building suspenders hung from central core, sag rods of roof purlins, members of trusses etc. are examples of tension members. Members used as bracings for lateral load as shown in above figure(e) experiences tension as well as compression. They are design to resist both tensile and compressive forces. Angle section and channel section as shown below are used as tension members. They can be used as single angle or double angle section or single channel or double channel sections. Circular rods, wire ropes are used tension members. Wire ropes are used as suspenders in cable suspended bridges. Tension members in bridges are used as built-up sections of channel section or I-sections. Stress-strain behavior of tension members are same as basic stress-strain behavior of steel because tension members are subjected to uniform stresses.